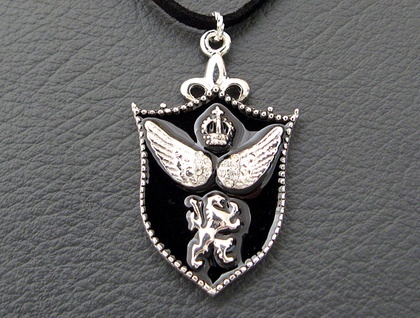 The shield shaped pendant on this necklace depicts a small crown above a pair of angels' wings above a rearing lion, all in silver, against a background of shiny black enamel. 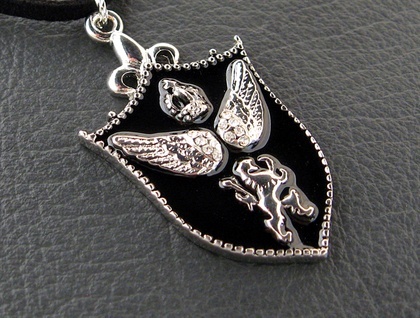 Each of the angels' wings is set with six tiny, clear rhinestones. This design is one of my favourites. 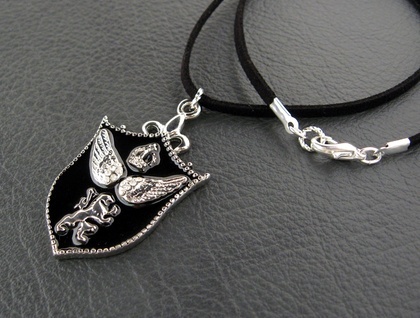 There is wonderful detail on the pendant, particularly on the feathers of the wings. Its top is shaped like a fleur-de-lys, and the sparkly rhinestones supply a dash of glitter without being overstated. The pendant is solid metal, weighty enough to sit perfectly without being too heavy, and is suspended on a length of imitation suede thonging. The necklace fastens with a silver-plated lobster-claw clasp and a small, silver plated, twisted ring. 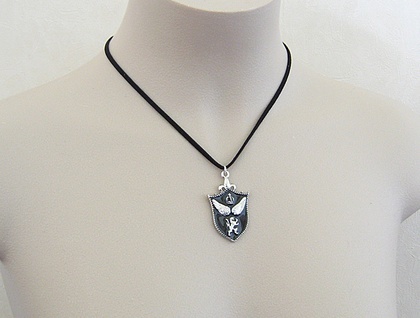 All other parts, aside from the pendant itself, are also silver plated. The faux suede is made of synthetic microfibre. It is deliciously soft and supple, and will not crack or smell. Nevertheless, it is not recommended that you get this necklace wet. The necklace measures approximately 46cm, including the clasp and ring, while the pendant measures 50mm lengthwise, including the baile (hanging loop), and 30mm across at its widest point. If you would like an extension chain, a different type of clasp, or a different length of cord, simply leave a message in the ‘notes to seller’ field when you check out of Felt, stating what you would like. There will be no extra cost. Extension chains will be silver plated, to match the clasp.